ScanSnap S1100 Document scanning at home or on the road. Whether scanning receipts, contracts, recipes, or plastic cards, ScanSnap takes scanning beyond the desktop and into your world. 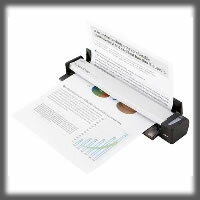 ScanSnap S1300i This multi-page double-sided colour scanner for PC or Mac is so compact you can put it almost anywhere! The 10-page automatic document feeder (ADF) scans both sides of each page at up to 12 pages per minute. ScanSnap iX500 With its 50-page automatic document feeder, this sheet-fed scanner gives you fast performance at up to 25 double sided pages per minute in colour or greyscale. Its automated features make it your quickest and easiest personal desktop scanning solution. ScanSnap iX500 runs on Windows & Mac OS X computers as well as iOS and Android mobile device and tablets. ScanSnap SV600 Scan anything from business cards to 279.4 x 431.8 mm (11x17in.) size (landscape) documents. No more hassle to cut or fold documents larger than legal size such as newspapers and magazines, simply position the documents and they can be scanned directly without any extra effort.